The series between Kentucky and Michigan State (Kentucky currently leads 12-11) is one which many contemporary fans may not be aware has a rich history. While the two schools have not met often, some of the important events in each school's history has been affected when the two have crossed paths. Prior to the last few years, where the two schools have agreed to two separate home-and-home agreements, meetings between the two were sporadic for nearly fifty years. However prior to that, Kentucky and MSU did have two extended series, the first running in the mid-to-late 1930's, and the second in the mid-to-late 1940's. The basketball programs at the University of Kentucky (then known as Kentucky State College) and Michigan State University (then known as Michigan Agricultural College) both had inauspicious beginnings and followed similar paths early on. Michigan State began playing the sport in 1899 with no coach directing them when they lost by one point to Olivet 7-6, leading to an 0-2 season. Over the next 28 years, the school saw eight different coaches lead the students against various local teams throughout Michigan and the upper midwest. But it was not until 1926 when Benjamin Van Alstyne signed on with the newly dubbed 'Spartans' that stability came to the school which had also had recently shed its 'Agriculture' name and at the time would be called Michigan State College. Van Alstyne came to Michigan State from Ohio Wesleyan, where he had completed a successful five year stint of 75-31. He would come to be known as 'Gentle Ben' and became well loved by his players, along with playing important roles among early coaching organizations. He would stay on as head coach in East Lansing for 22 years and compile a 232-163 record and would later be named to the Helms Hall of Fame in 1959 for his efforts. Kentucky started playing the sport a few years later in 1903 when a few students rounded up enough funds for a ball ($3) and, without a coach, promptly lost to nearby Georgetown College 15-6, en route to a 1-2 season. Over the next 28 seasons, the program would see no fewer than 18 different coaches try their hands at directing the Lexington lads against local Kentucky teams and colleges throughout the Ohio Valley. The early going was rough as eight of their first nine seasons were losing ones (unlike Michigan State which saw 13 of its first 16 squads record winning records). Kentucky did make progress in the 1920's as they began to record winning seasons more often than not and they became affiliated with the Southern Intercollegiate Athletic Association (SIAA). The SIAA was a large group of loosely-organized schools located throughout the South. Kentucky was able to win the very first conference championship in a tournament held in Atlanta, Georgia but still was inconsistent through much of the decade. The SIAA would soon morph into the Southern Conference, and later a major split would occur which would find UK as a member of the Southeastern Conference, a position they retain today. Only in 1930, when Adolph Rupp was hired to coach the Wildcats, did stability arrive in Lexington. Rupp would remain at the school for 41 seasons and become the winningest coach in college basketball history. The first match-up between the two schools occurred in February of 1935 in Lansing. Having made a name for himself throughout the South, Kentucky head coach Adolph Rupp was eager to expand Kentucky's fortunes beyond the region and compete with the more highly regarded regions in the Midwest and the East Coast. The 1934-35 squad gave him a good excuse to attempt just that. Kentucky was led by first-year varsity player Leroy Edwards, a rugged 6-5 center out of Indianapolis, who would later be named All-American that season. With Edwards in the fold to go along with another star in senior Dave Lawrence, Rupp made some initial moves toward a national non-conference schedule. A game against the University of Chicago was held in Lexington early in the year, however most significantly, Kentucky traveled for the first time to New York City where they met the Violets of New York University in Madison Square Garden. While UK ended up losing the game by a single point, it was a significant one on many levels and helped pave the way for future achievements. When Kentucky traveled to East Lansing, they had but that single defeat on their record; as they had won the other 14 contests. Michigan State College was also having a successful season under 9th year head coach Benjamin Van Alstyne. The Spartans were 13-3 and led by center co-captain Arnold Van Faasen. 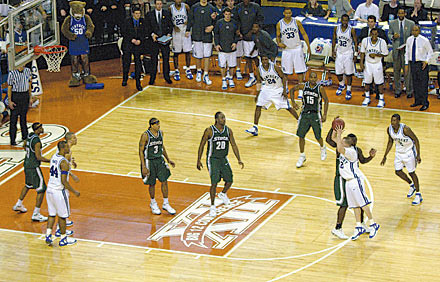 The game with the Wildcats marked the final home game that season at MSU's home court, Demonstration Hall. The game proved to be a barn-burner as the two teams fought neck-and-neck through the first half. The Wildcats concentrated their defensive efforts on containing Van Faasen, and were successful in holding him to two points, both on free throws. The halftime score was 16-14 in favor of the Spartans, after MSC guard Bob Herrick scored a field goal just before the half ended. In the second half, Kentucky sped out with an offensive outburst, however the Spartans closed the gap midway through the half and went ahead 26-25 on a Herrick field goal. After that, the Spartans held the Wildcats to only one more point and went on to victory with a final tally of 32-26. Remembered Ron Garlock about the game: "After one or two minutes of the first half, our Arnie VanFaasen had three fouls trying to guard the biggest and fastest guy I had ever seen in a basketball game. This was Leroy Edwards who quit in his sophomore year to go to the pros. Then it came time for me to guard him. The only answer I could see was to hold onto his pants and step on his shoes. Before long, I too had three fouls. But we did the job." Herrick proved to be the hero to the 4000 spectators present as he scored 14 points. Kentucky's pivotman Edwards led all scorers with 16 points. Kentucky did suffer more than their second loss, as forward Jack Tucker broke his hand in the game. The senior co-captain was not able to return for any of the remaining five games on UK's schedule, although Kentucky managed to win them all. After the game, the star guard Herrick wrote a letter to Rupp on the part of the MSC team to compliment Kentucky on a well-fought game. Wrote Herrick, "Our midwestern basketball is usually a case of 'dog eat dog,' and it is a real treat to play as cleanly a fought game as was ours. We begin to understand much better the expression 'Southern gentlemen.' We are extremely sorry that Mr. Tucker was hurt in our game, and hope that his services will not be lost to the team for long. We would like to express our admiration for Anderson, who, we understand, played the entire game with a painful toe injury. In conclusion it is our opinion that your team is the finest in every respect we have seen in action this year, and believe that in Edwards you have a true All-American." The following year saw the Spartans return the favor by traveling down to Lexington to face Rupp's squad. The Wildcats were once again undefeated, save for yet another loss to NYU in New York City, however the 1935-36 squad was not the same caliber as the year before. Not only had UK lost Dave Lawrence to graduation, but the major cog of their team was missing after Leroy Edwards prematurely decided to return to Indiana and take a job with a company which was associated with a semi-professional league. Rupp and the team were caught off-guard, with a progressively more difficult schedule ahead of him, but without the star player he had counted on being there. As for Edwards, he went on to eventually join the Oshkosh All-Stars where he became one of the most prolific scorers and legends of the NBL professional circuit. 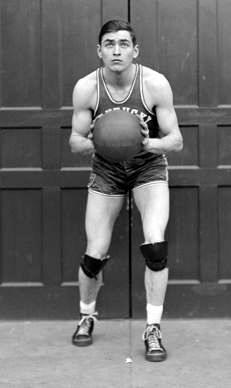 Despite only playing one season of collegiate basketball, Edwards did more than most can claim over their entire career as he helped to usher in the ratification of the three-second rule (due to rough play on him in the NYU game) and he was named to many all-decade NCAA teams from the 1930s. If Rupp thought his team was undermanned, MSC coach Benjamin Van Alstyne had bigger concerns. Of all the players who faced Kentucky the year prior, only Ronald Garlock and Dan Reck had seen action in the game at Lexington. The Spartans were showing the effects, as they entered the game with a lackluster 5-6 record. Despite this, the visitors put up a tough fight in the first half and used their ball-handling wizardry to go ahead of the Wildcats 16-15. The score had been tied three times during the half. The second half was all Kentucky, as UK forward Ralph Carlisle got hot and finished the game with a game-high 16 points, on 7 field goals and 2 free throws. Michigan State was held to only a single field goal in the second half, and the final score was a lopsided 27-19. Garlock led the Spartans with 8 points, on two field goals and four free throws. Joseph Smith also scored two field goals and he was the only other player to score more than one for the visitors. The game was physically rough and got progressively worse towards the end until UK's fiery Joseph 'Red' Hagan was ejected for 'throwing a right' at a Michigan State player. Said Van Alstyne about the Wildcat squad "Coach Rupp has another good team. However I do not believe it is near the strength of the one last winter, especially with Edwards out of the line-up. As for my boys, they are just a group of youngsters with a lot of promise." The 1936-37 season marked the first time that the two schools held a home-and-home series between each other in the same year. While common among conference opponents, this arrangement was not very typical for out-of-conference foes (although likely a good situation for Michigan State which had yet to have a conference affiliation). The first game was once again held in Lexington at UK's Alumni Gymnasium. And as with the first two contests, the Spartans held a slim halftime lead after a tight first half. According to Lexington Herald correspondant Ed Shannon "The first half probably was the fastest and most interesting seen on the local court this season." The Spartans were led by Ronald Garlock and the squad used a strong defense to hold back the Wildcat attack. On the offensive end, the set plays seemed to confuse the Wildcats, with only Joe Hagan seemingly able to decipher the visitor's offense and be in position to defend the MSC attack. Spartan reserve Leonard Osterlink was put in the game late in the first half and he soon scored on a one-handed flip shot, then followed that up by canning a long shot from behind the arc just as the whistle sounded to signal the end of the half and put MSC in the lead, 14-13. But as with the game the year prior, the Wildcats mounted a second-half comeback and held a commanding 23-15 lead with 10 minutes remaining. Ralph Carlisle, who had been injured in the first half when a MSC player slipped on the slick floor and crashed into him, which resulted in a bloodied nose, returned for the second half and ended the game scoring a game high 14 points. The slick floor proved to take a toll on the Spartans, as many of them had difficulty keeping their balance. Only with the help of some rosin which was applied to the soles of their shoes were they able to right themselves. The Wildcats had a large enough lead that in the last few minutes of the game, Kentucky coach Adolph Rupp replaced his starters with an entire second unit. Van Alstyne did likewise and the final score was 28 to 21. The followup game occurred less than two weeks later at East Lansing in Michigan State's Demonstration Hall. In an all-too-familiar story-line, Michigan State held a slight lead, 12 to 11 at halftime. The home team then went on a run to start the second half and the Spartans saw themselves with a comfortable 23-15 advantage. But the pattern which had been established in the prior two games was broken as the Wildcats mounted a late comeback, largely on the back of three baskets by junior guard Bernard Opper, to claw within a single basket with only a few minutes remaining in the contest. With Kentucky trailing 23-21, Opper was instructed to hold onto MSC's Howard Kraft until a foul was called. The Wildcats were taking a gamble that Kraft would miss the free toss and Kentucky could grab the rebound and have a chance to tie the score. But their plan backfired when Kraft converted the free throw to put Michigan State ahead by three. The next play down the floor, Opper received a short pass on a nifty out-of-bounds play and scored cleanly to put the Wildcats within one point with only 36 seconds remaining. 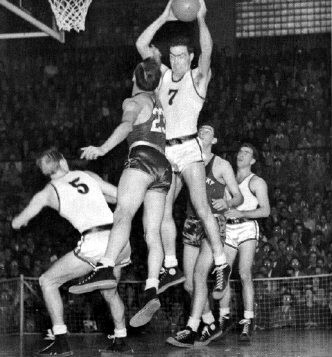 Rupp called timeout to assemble his troops, and sent in reserve Homer Thompson to win the center jump, which resulted after every made basket according to the rules of the day. Despite being hampered with an ailing throat, Thompson was successful in securing the tap for the Wildcats, however neither Opper nor Ralph Carlisle could convert their long desperation shots, and Michigan State escaped with a 24-23 victory. Nelson led the Spartan attack with nine points, while Ronald Garlock added six and Howard Kraft five. 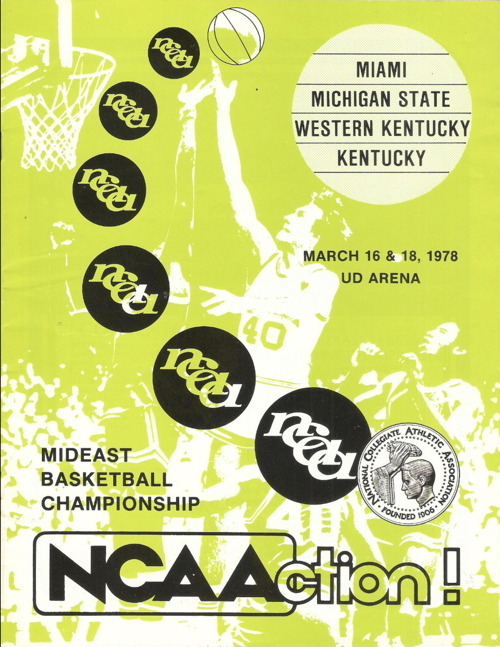 The following year saw Kentucky travel to East Lansing as part of a tour of the Midwest which would also include road games against the University of Detroit and Notre Dame. Even before the tour officially started, Kentucky was undefeated but road weary as they had traveled from Louisiana where they had beaten a Harold 'Doc' Carlson-led Pittsburgh squad in the Sugar Bowl Classic in New Orleans. Kentucky took the early lead on field goals by Joe Hagan and Bernard Opper, however Michigan State soon clawed back to tie the score at eight, and after Howard Kraft and George Falkowski converted perimeter shots to put MSC in front, the Spartans never gave back the lead. Kentucky closed to within four points in the second half, but the Spartans held on for a 43-38 victory. Key to the win was the defensive work of State center Frank Shidler. He held UK center Homer Thompson to four points. UK's comeback effort was also hampered when starter Fred 'Cab' Curtis fouled out of the game in the second half with four fouls. Falkowski led the Spartans with eleven points, while forward Mardi Hutt added ten and Shidler nine. Nearly a month later, Michigan State traveled to Lexington for the return match. 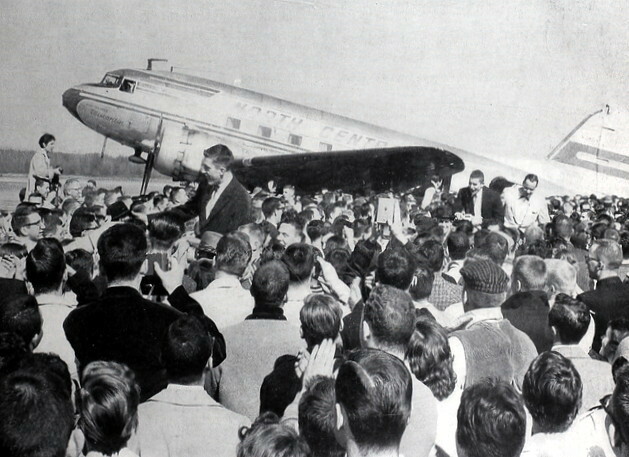 A crowd of 4,000 spectators, which included the governor of the state (A.B. 'Happy' Chandler), jammed Alumni gymnasium to witness the event. And they would not go home disappointed. 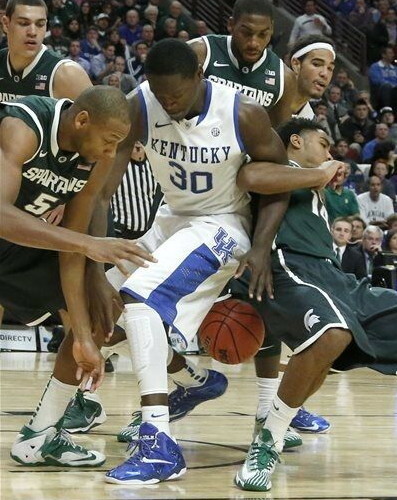 The play was rough, with Kentucky trying to keep the Michigan State big men away from the interior. At one point in the first half, the play got so rough that a double-personal foul was assessed on UK's J. Rice Walker and MSC's Howard Kraft. Here is how the Lexington Herald's Neville Dunn described it: "These two lads hit the floor with arms and legs wrapped around each other and for a moment it looked as if they were going into a grunt and groan act. When the whistles of the officials blew simultaneously, Walker had a half-Nelson on his opponent and Kraft was vainly trying to pin a scissors-hold on the Wildcat captain." As it turned out, the officials (Dan Tehan and Jack Travnicek) were kept busy as Walker, Bernard Opper and Homer Thompson all were ejected on personal fouls. MSC's Leo Callahan also acquired four fouls and had to leave the contest. The difference in the game proved to be the outside shooting of UK guard Bernard Opper. He hit six field goals from long range and led the team with 14 points for the night. Joe Hagan added 11 for the Wildcats and Kentucky won going away, 44-27. Michigan State scored only seven field goals the entire game, with nearly half their total points coming from the foul line. After the game in 1938, the record stood at a 3-3 standstill between Rupp and Van Alstyne, with the home team winning each time. The series would end at that point and when it was resumed nearly seven years later, the world was literally a different place. Michigan State's program continued to grow under Van Alstyne's leadership. The year after the series with Kentucky ended, MSC welcomed their first All-American caliber player in Chet Aubuchon. In 1939, the school received a boost when a wealthy alumnus left sufficient funds to help build a new (and badly needed) gymnasium. 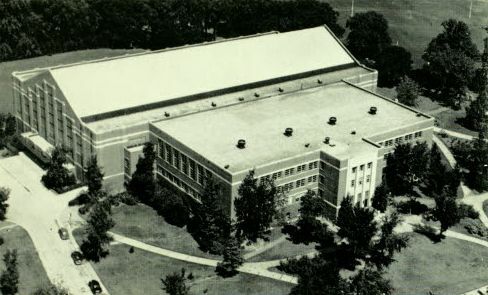 The building, which was named Jenison Fieldhouse after the donor, was patterned after the Purdue Fieldhouse which had been built a few years earlier in West Lafayette IN. Kentucky also continued to grow under Rupp's leadership in the late 30's and early 1940's. At this time, Kentucky started to exert its strength against teams of the Midwest, such as Indiana and Notre Dame which up to that time had dominated the Southerners. The entry of the United States into the second World War put a severe dent into many of the basketball programs around the country. With the war raging overseas and most every available man being called into duty, keeping a viable team together was seemingly a full-time job, even while the season was in progress as players were called up at any time. Rupp did everything in his power to keep the Kentucky program going, once vowing to a newspaper reporter that he'd play 'all girls' if he had to. As it was, the lean years consisted of filling the roster mainly with freshmen too young to be drafted along with others who, for whatever reason, had been declared by the military to be unfit for service. The 1943-44 season was nearly cancelled, with two sophomores representing the veteran leadership and fifteen freshmen rounding out the rest of the squad. As it turned out, that team gelled under Rupp's guidance and won the SEC Championship along with finishing third in the highly regarded National Invitational Tournament. Michigan State wasn't so fortunate, as the 1942-43 team finished with a dismal 2-14 record, and they had to cancel their 1943-44 season. Although unfortunate, the cancellation made it that much harder the following year when an entirely new group of players arrived, none with experience. The group that arrived, however, had talent and they would prove to be a force to reckon with for years to come. 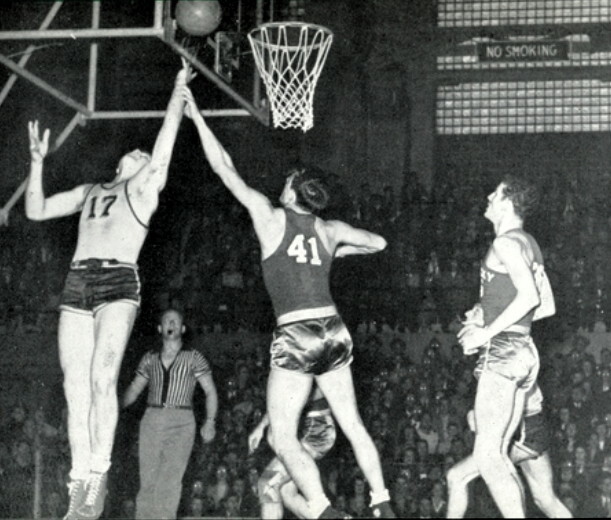 The 1944-45 Michigan State squad was led by forwards Sam Fortino and Robin Roberts, along with center Bill Rapchak. (Roberts would go on to become a Hall of Fame baseball player.) Each would average double-figures that year and the squad would finish a respectable 9-7, although the beginning was shaky. The first game of the renewed series looked like a blowout on paper and it was, although it took some time to develop. At the time, Michigan State had started the season 2-6, with their only victories over Drake and Albion. Kentucky was rated #1 in the country, but it was MSC that went ahead early in the game, largely on the work of Robin Roberts and Joe Krakora, both of whom had only recently joined the Spartan squad. Although tied three times in the half, Kentucky could not go ahead and Michigan State led at halftime 24-18. The second half, however, belonged to Kentucky and the man of honor, freshman Alex Groza. Groza scored six field goals inside in the second half and opened up the outside for veteran Jack Parkinson, who finished the night with 23 points on 11 field goals. Kentucky pulled away by blitzing the Spartans, who were helpless to stop the assault. Kentucky ended the scoring with a 66-35 victory. Joe Krakora was high man for the Spartans with 10 points, while Robin Roberts added nine. Groza had been inducted into the Army earlier that year and after some delays, was finally ready to report. The Michigan State game would be his last game at UK until well after the war was over. He entered the gym just before the game tipped off after visiting his parents in Martins Ferry, OH. When he walked into the gymnasium, the crowd cheered loudly, and "the walls trembled violently" as he finally entered the game midway through the first half. Two days later, he was an enlisted man. Said Groza years later: "I'll never forget my train back to Lexington was a few minutes late. They picked me up, rushed me to the gym, brought me out at halftime, and presented me with a key to the university and farewell gifts. That was probably the nicest thing that had ever happened to me up to that time. I knew then I was a Kentuckian for life." With the pivotman Groza gone, the UK team took on a different look. They struggled on the road, losing rough games to Tennessee and Notre Dame, and struggling with Georgia Tech on the road before righting themselves with two solid victories at home over Georgia and Georgia Tech. 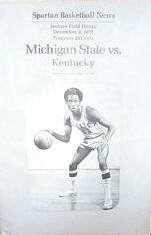 The following game was a rematch with Michigan State less than a month after the first contest was held, but in East Lansing where Kentucky had never won. Kentucky took an early lead in the game, but Michigan State quickly tied it up and took the lead after three minutes had elapsed on a layup by Nick Hashu. The Spartans never looked back, as they extended the lead to 33-22 at halftime. UK Coach Rupp substituted throughout the game, trying to find a combination which worked. Kenton 'Dutch' Campbell, Groza's replacement at center, went scoreless in the game, before being replaced. At one point in the second half, the Wildcats did go on a 9-point run to cut a 44-26 deficit to 44-35. However the Spartan starters, who played the entire game, were able to control the lead and went on to secure the victory 66-50. Bill Rapchak paced Michigan State with 20 points, while Sam Fortino added 19. 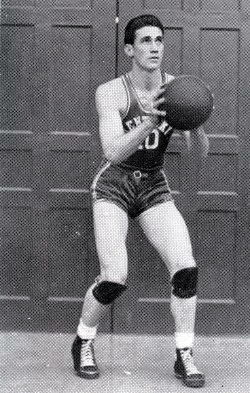 Jack Parkinson led UK with 17 points, with most of his field goals coming from the perimeter. The win was totally unexpected for the underdog Spartans. Said Rapchak, "I remember when we called the State Journal with the score, whoever answered the phone told Nick Kerbawy, our publicity director, to call back when he was sober, then hung up. It was the 'Coca-Cola Upset of the Week.'" The following year saw Kentucky return to Jenison Fieldhouse, and this time they were able to break the jinx, winning 55-44. Freshman guard Ralph Beard was the catalyst as he scored 18 points on the offensive end and harassed the Spartan guards on the defensive end. Another freshman, Wallace Jones, was playing out of position that year at center, but still managed to control the rebounds. Jones scored 11 points and Jack Tingle added 12. Kentucky went ahead 29-17 at halftime, and were able to hold the lead over the tired Spartans. 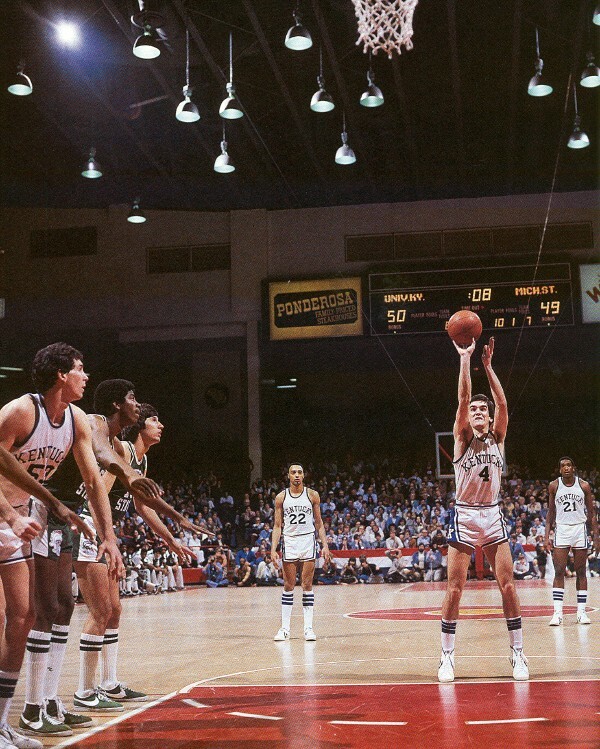 Oliver White was the high man for Michigan State with 14 points, while Robin Roberts added 11. The followup game a few weeks later saw Kentucky hold serve on their own home court, which effectively allowed UK to decisively pull ahead in the all-time series 6-4. But the victory didn't come easy as Michigan State was ahead at halftime 26-23 and pushed the lead to 9 points later in the second half before Kentucky made their comeback bid. The first half was tight, as UK center Wallace Jones collected four personal fouls in the first 12 minutes and had to sit the remainder of the half. As the second half unfolded, MSC extended the lead but Kentucky came back, largely on the backs of Jones, Wilbur Schu, Jack Parkinson and Kenton Campbell. Sam Fortino and Robin Roberts led Michigan State with ten points each. The score was tied 50-50 with five minutes remaining, however at that point Kentucky went on a 9-1 run to provide the final margin. 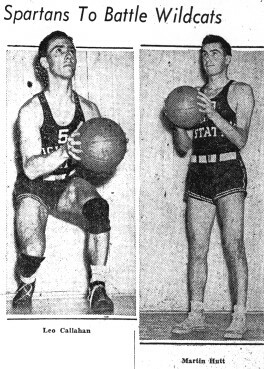 The 1946-47 season saw the return of many of the veterans who had left Lexington due to the war, including both of UK's centers from previous years, Alex Groza and Bob Brannum. They blended in with the veterans such as Jack Parkinson and Jack Tingle and the youngsters such as Wallace Jones and Ralph Beard to form some of the most talented and deepest teams in college basketball history. When they visited New York City that year, the Associated Press said they were "the greatest aggregation to visit the Eighth Avenue arena." 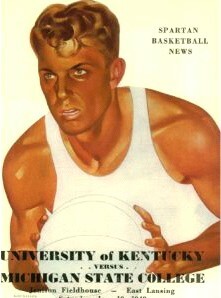 Brannum had played at Kentucky only one season, 1943-44 where he led the team in scoring and would go on to become the youngest player to be named a Consensus All-American. Groza and Brannum had actually been teammates for the first time at Fort Hood while in the Army. After completing his infantry training, Groza was set to ship out overseas when an officer at the camp gave him the opportunity to stay and compete on the base's newly formed basketball team. Groza jumped at the chance and was transferred to the Medical Corps on the base. The name of the officer was Bob Brannum. Now in the fall of 1946, they were both back in Lexington competing for the starting position at UK. Just to illustrate the type of competition on the team, the others competing for the spot were Kenton Campbell, who had earned All-SEC honors in 1945 after Alex Groza left for the Army, and Jones, who was named All-SEC the following year as a freshman. Even the fifth-string center, Malcolm McMullen, later transferred to Xavier where he starred before playing in the newly formed NBA. Groza earned the starting nod. While he was away in the army, he had been transformed from the 6-foot-5, 170 lb player he was as a freshman to 6-7 and 220. He was a very smart player who had great court sense, had excellent touch and was very quick for a big man. Brannum was shorter than Groza and more of a banger, who used his strength and tenacity to wear down the opponent. When UK and Michigan State met, the Wildcats were 19-1, with their lone defeat to a tough Oklahoma State squad in the Sugar Bowl Classic. Most of their victories had been blowouts. Michigan State was struggling with a 6-6 record, with their previous four games all losses. The game was expected to be a blowout and it was. Kentucky raced out to a 50-11 halftime lead and coasted the rest of the way for a 86-36 verdict. This margin of defeat would only be bested over 25 years later by Indiana in 1975. Said a happy Coach Rupp after the contest, "It was the best I have ever seen. The boys really exploded." Leading the Wildcats in scoring was Brannum, who connected on seven field goals and scored 14 points in a reserve role. Ralph Beard scored 12 and Groza and Jones added 11 each. 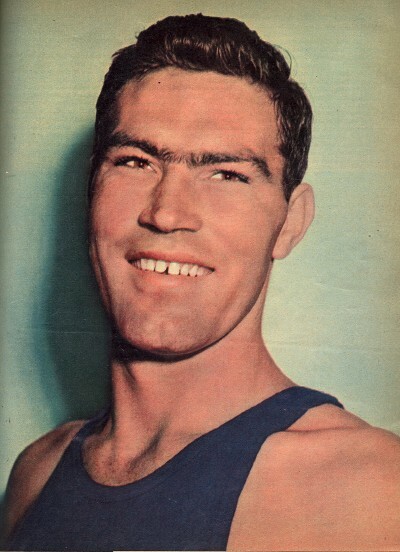 Robin Roberts was the only Spartan to score in double figures, as he contributed 14. Kentucky continued to win that season, however problems began to arise in the postseason. There was a rule which stipulated that only 10 players could participate per squad in the SEC Tournament, held in Louisville's Armory. Rupp was against the rule, and hoped to have it changed so that 12 players could go, but his fellow SEC coaches didn't go along with his wishes and voted the proposal down. With the setback, Rupp had some hard decisions to make. At the last moment, he decided to take a pair of freshmen, Jim Line and Dale Barnstable instead of Brannum and another veteran Jim Jordan (who was named All-American while a Naval Trainee at the University of North Carolina). Said Rupp about the decision, "We'll need speed, not height to win this affair." On the first night as Jordan and Brannum sat in the stands watching their teammates massacre Vanderbilt 98-29 in the first round, the two were asked about Rupp's decision. "We have to agree with the coach," Jordan sadly responded. Brannum smiled and said, "There's really not much I can say, is there?" Kentucky was invited to the prestigious National Invitational Tournament that year, but before they left, they tuned up for the tournament with a 68-29 blowout of Temple in which Brannum scored 7 points. That would be his last game in a Kentucky uniform. The earlier snub by Rupp convinced Brannum to transfer, and he made his plans to do just that as Kentucky was travelling to New York City. In the Big Apple, curious sportswriters badgered Rupp about Brannum not accompanying the team. At one point, Rupp snapped, saying Brannum "just wasn't good enough to make the team; and if any of you coaches are interested, his telephone number is Lexington 682." Meanwhile, Brannum had already decided to transfer to Michigan State. While at Fort Hood, Brannum had befriended Robert Jones, who was a staunch Spartan supporter and he was able to plant a seed in Brannum's head. Brannum enrolled in time for the spring quarter and with summer school, would be eligible to play the following year. Said Brannum about the decision to leave, "One thing that kind of shook up Mr. Rupp was to have a married ballplayer. That was usually a 'have-to' in those days. But that wasn't the case with us. Let's just say we have our share of run-ins. He as pretty snotty about the whole thing. And by the time, I was no longer interested in Kentucky." At another time, Brannum was more equitable as to where the fault lay. "I didn't put out like I should," said Brannum. "Mr. Rupp and I never had words. I was unhappy that I wasn't playing. He was unhappy with my performance. You don't just walk in at Kentucky and take a position, no matter who you are." The match during the 1947-48 season was billed as a showdown between All-American Groza and Brannum, and it lived up to its billing. A record 15,384 spectators jammed into Jenison Fieldhouse, by far the largest crowd ever to see a basketball game in the gym, before or since. After the game, the fire marshall downgraded the capacity of the gymnasium to prevent a repeat. The game shouldn't have been close on paper. Kentucky was in the midst of one of their greatest seasons in school history, and just the game before against Miami (OH) had finally settled on a starting lineup which would go on to be known as the "Fabulous Five." This famed group would go on to win the NCAA Championship and later the Olympic Games in London. Michigan State, despite landing Brannum and having big man Bill Rapchak return after many years, struggled during the year. MSC coach, Benjamin Van Alstyne, was not in good health, was admitted to the hospital with an appendicitis attack just prior to the season beginning, and was just getting back into the swing of things by the time Kentucky came to town. But the sheer will-power of Brannum kept the Spartans in the thick of the game with UK and almost led to the upset. Michigan State stayed close throughout, as the score was tied four times in the first half and five times in the second. Said UK reserve Al Cummins about Brannum, "He knew all our plays. When we ran the guard-around, there he was." 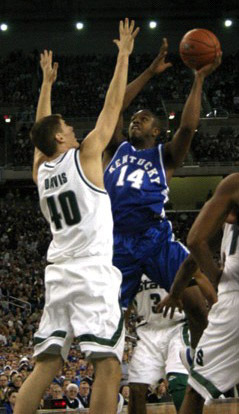 Incidentally, Cummins himself would transfer to Michigan State from UK the following year. Kentucky's largest lead was just before the first half ended when they went ahead 24-19. However Brannum tipped in a shot just before the gun sounded and the Spartans trailed by only three points, 24-21. The second half remained tight, and was close throughout. Only with about five minutes remaining did Kentucky make a run, as Dale Barnstable hit five straight free throws and a clutch jump shot from the corner to put the Wildcats in what they thought was a commanding four-point lead. But UK lost the ball while trying to go into a stall, and Michigan State was able to recover. Brannum scored two straight baskets to tie the score at 43-all with one minute, forty seconds remaining. Jim Line hit a free throw to put UK ahead, but Michigan State came right back and Brannum was prepared to put them ahead with an easy basket, however he lost the ball and Kentucky recovered, pulling ahead by three on a layup by Ken Rollins with 45 seconds remaining. Michigan State didn't give up, as Don Waldron hit a desperation toss to bring the Spartans within a point with 10 seconds remaining. Kentucky successfully ran out the clock with Rollins only being fouled as time expired. He sank the free throw to provide the final 2-point margin, 47-45. Brannum ended up scoring 23 points on ten field goals and three foul shots. His UK counterpart, Alex Groza was limited to ten points. Said Brannum about what might have been, "We could've sent it into overtime. From there, who knows ? But it was one of the highlights of my career - of my life, really. I was glad to give such a big crowd a good show." Said Rupp of the game, "Michigan State has a fine team, and they were keyed up for us tonight. We'll have a lot more games like this before the season ends. This huge crowd tonight shows how badly they wanted to beat us." Bob Brannum skies for a rebound while Cliff Barker (23) grabs for the ball and Alex Groza looks on. After the game, the two programs once again went their separate ways. Michigan State experienced some major changes as Van Alstyne retired in 1949 after 22 years and 232 victories at the school. He was replaced by a pair of innovative young coaches, first Pete Newell who stayed for four years before returning to his native California and later by Forrest 'Forddy' Anderson. Anderson started at Michigan State in 1954 and instituted a fast-break pressure offense which proved popular and heightened interest in the sport on campus. He was no stranger to Kentucky, having coached against them previously while at Bradley in the late 1940's and even as a player, where the former Stanford star faced UK during World War II while he was a member of the Great Lakes Naval Station. The school itself changed as it left the ranks of the independents and joined the Big Ten conference in 1949, where it was a natural fit with the other large land-grant universities of the Midwest. To reflect this growth, the name of the school was also changed to Michigan State University in 1955. Kentucky too had gone through some dramatic changes. After winning three national titles in four years in the late 40's and early 50's, the program was rocked as being part of a national point shaving scandal which shook the school to its foundation and resulted in UK missing a complete year of participation in the sport which it had dominated. But the setback wasn't enough to keep Kentucky and coach Rupp from bouncing back, much to the chagrin of their rivals, and they were soon competing once again at the highest levels in college basketball. When the two programs met again in 1957, the stakes were higher than ever before. The setting was the Midwest Regionals in the NCAA Tournament, which was being held at UK's Memorial Coliseum, where UK won nearly 90% of the game they played. (This was at a time when it was not illegal, and in fact not uncommon, for the host school to also be competing in the tournament on their home floor.) The Michigan State squad was likely the best team ever fielded by the university up to that point, and this was evidenced by the fact that this was the first Michigan State squad to ever be invited to the NCAA Tournament. The Spartans were led in scoring by guard Jack Quiggle and forward Larry Hedden, however their major force was that of sophomore center Johnny Green, who only joined the team in January when he became eligible after enrolling as a freshman the January prior. This was after Green had completed his service with the armed forces. Green was an extremely raw talent, and was a late bloomer, not playing high school basketball and only growing to 6-5 when he was 20 years old. Although at the time he lacked many of the skills needed to be a great scorer, he used his athleticism to develop into a dominating rebounder and shot blocker, and later in his career was able to improve his scoring to enable him to become an All-American. The addition of Green was enough to help the Spartans tie for the championship of the Big Ten and he impressed so much that he was named all-Big Ten, despite the late start to his season. MSU survived a two-point win over Notre Dame in the NCAA Tournament in order to face the home team, Kentucky, the following night. The Wildcats had a good nucleus of players, including Johnny Cox, Gerry Calvert and Vernon Hatton. The 3rd ranked Wildcats seemed to be in control of the game during the first half as they sped to a 47-35 halftime margin. But the 11th-ranked Michigan State came back, mainly on the back of Quiggle, who scored 18 of his 22 points in the second half, and timely rebounding and put-backs on the part of Green. At one point the Spartans scored 10 straight points to knot the score at 51-all. The score was tight for most of the rest of the game, but eventually, the Spartans gained a lead and held tight, despite Green fouling out. "I'll never forget John fouling out with about 12 minutes left," said WKAR broadcast Jim Adams. "He stood on the bench, waved his warmup jacket over his head and did everything he possibly could to keep (MSU reserve center Charles) Bencie going." With 8:32 left in the game, MSU's Coach Anderson called a time-out and instructed his team to begin to play a ball-control game. The Spartans came out of the timeout and began to effectively freeze the ball, at one point seeing three minutes come off the clock without either team scoring. The game was still tight with Kentucky behind by one point with a little over two minutes remaining, however Quiggle snuck in for a layup where he was fouled by Hatton. Quiggle converted the three-point play and Kentucky never again threatened. MSU was able to use the rest of the time to convert easy baskets against UK's desperation defense and the final margin was 80-68. Most of the capacity crowd of 12,500 left the game disappointed. When later asked about the upset, Green said "You just didn't beat Kentucky at Kentucky. Adolph Rupp's teams were dominant there. But long before they had any black players, he came up to me at a function and said, 'Gee, I wish I had you on my team.'" Michigan State went on to the national semifinals in Kansas City, where they lost a heart-breaker to Frank McGuire's North Carolina Tarheels in triple overtime. The following year, the Wildcats unexpectedly won the NCAA title. Many years passed before the two teams would meet again. Finally in 1971, the two schools agreed to a two-game home-and-home series. The first game was held in Lexington in what would be Coach Rupp's final season as head coach. The Michigan State coach was Gus Ganakas, who had been an assistant coach under John Benington and was promoted after Benington suffered a heart attack and died in 1969. Michigan State entered the game unranked and undersized. Their tallest player was 6-7 center Bill Kilgore while their point guard was 5-foot-5 Gary Ganakas, the coach's son. Said Coach Ganakas about his squad, "We've got a funny-looking ball club and our team only averages 6'-2. But we've got zip. You can't take us lightly." But Kentucky wasn't in a great position to take advantage on the inside. The season before, they had lost their pivotman of the future when 7-foot sophomore center Tom Payne left school to join the NBA's hardship draft. Also, another big man, Tom Parker, was out of action having suffered a sprained ankle the game before in a loss to Indiana. Beyond that, other players were injured which left UK without any of it's regular starters from the prior year. The guards ? "We sent in every play from the bench in the first half and they ran two of them." The forwards ? "What'd we get out of (Dan) Perry ? No points. and out of (Rick) Drewitz ? Three points. We finally had to move guard, (Stan) Key, up there and he didn't want to do it because he didn't know how to play forward and didn't want to be criticized." The center ? "There's nothing I can do about the center situation," said Rupp. "I just don't have anyone else. I wonder if all the people around still think (Jim) Andrews is better than (Tom) Payne after watching tonight." 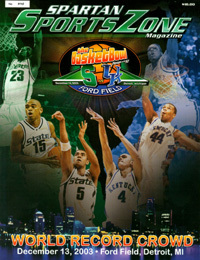 The following year, Kentucky opened the season by travelling to Jenison Fieldhouse. However, gone was a key figure who had been on the UK sideline since the series began, that of Adolph Rupp, who had been forced to retire by the university the previous spring. In his place was a former player and assistant coach, Joe B. Hall, who had some big shoes to fill. The game was not only the debut of the coach, but for a group of sophomores whose talents were highly anticipated. On Kentucky's side, that included Kevin Grevey and Jimmy Dan Conner among others. For Michigan State, this included Lindsay Hairston (although his actual debut had occurred a few days earlier in an MSU win against Toledo). But the sophomores were nervous and it showed in their game. Said Grevey, "Boy, is it good to get that one out of the way. I've never been so nervous in my life. We were TIGHT ! You could see it in the way we were shooting." The poor shooting didn't extend to just the UK sophomores, as highly regarded Hairston shot just 1 for 11 from the field for two points. The leader for UK was Jim Andrews, who contributed 20 points and 13 rebounds before sitting out the remaining five minutes of the game with foul trouble. Conner added 14 points and another sophomore, Bob Guyette added 11 and played well enough to allow Kentucky to win the game 75-66 without requiring Andrews to return. Leaders for the Spartans were senior Bill Kilgore with 23 points, Mike Robinson with 18 and Allen Smith with 12. The next meeting was another high stakes meeting of the type seen in 1957. 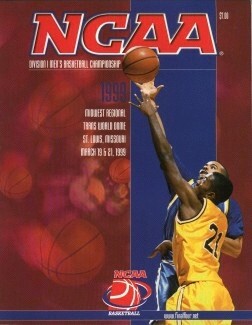 This time, the Wildcats were the #1 ranked team in the nation and were the favorites to win the title. They were led by a battle-hardened group of seniors which included All-American's Rick Robey and Jack "Goose" Givens among others. Michigan State was ranked #4 in the nation and were led by a young group of stars in junior Gregory Kelser and freshmen Earvin "Magic" Johnson and Jay Vincent. The coach for the Spartans was "Jud" Heathcote, a fiery coach from Montana who had taken over the position in 1976 after Ganakas had been fired. Heathcote was fortunate to take over at a time when the building blocks for the future were largely in place. Kelser was already in school and Vincent and Johnson were slated to sign. With the unknown Heathcote taking over, the University of Michigan sensed an opening and tried to persuade Johnson to Ann Arbor. It nearly worked, however Johnson ended up remaining loyal to the local Lansing community and signed with Michigan State. The site of the game was the University of Dayton Arena and the stakes were for the right to go to the Final Four in St. Louis. Kentucky's seniors helped UK build an early lead but their offense sputtered and with Greg Kelser fueling them, Michigan State was able to go ahead 23-22 with a little over three minutes remaining in the first half. The Spartan lead was extended to 27-22 by the half as Kentucky shot a poor 40% from the field as compared to 57% for Michigan State. The second half saw MSU lengthen the lead to 31-24 before Kentucky would make it's slow comeback bid. After trading some baskets, Kentucky finally closed the gap considerably when Kentucky sophomore point-guard Kyle Macy [a transfer from Purdue] scored three points and this was followed by a steal and basket by senior James Lee, which tied the score 35-35. Kentucky's comeback effort was aided when Johnson picked up his fourth foul with over nine minutes remaining in the game. By the seven-minute mark, Kentucky pulled into the lead on two free throws by senior Mike Phillips. The rest of the game saw MSU struggle with foul problems and Macy hit his foul shots down the stretch to ensure the UK victory. Macy scored seven of UK's final nine points, all at the charity line. "We fouled the player we didn't want to," said Michigan State head coach Jud Heathcote. "I can assure you it wasn't intentional but it happened." The key to Kentucky's woes in the first half was Michigan State's tough 2-3 matchup zone. At halftime, on the suggestion of Assistant Leonard Hamilton, Coach Hall called Macy and senior Rick Robey together and instructed them to play a pick-and-roll game. "I'd read off the pick and get in the gap and try to hit Jack (Givens) on the wing or Rick rolling back. As it worked out, they back off of me and I got a few shots to go and got a few fouls when they were late getting to me. And I was fortunate enough to hit the shots," said Macy. After the game Coach Heathcote said, "We were beaten by a great basketball team. We told our kids whoever won this game would win the national championship. We could have won it. Now I believe Kentucky will win the National Championship." Kentucky went on to the Final Four where they dispatched a tough Arkansas squad and then won the championship game over a young Duke team on the back of 41 points by Jack Givens. Michigan State went home disappointed but they were encouraged by just how close they had come. Said Greg Kelser, "I think we wouldn've beaten Arkansas and Duke in the Final Four. They were too slow to stop us. I remember seeing the championship game and marveling at how Duke couldn't stop 'Goose' Givens. Michigan State would return the next year and win their first title in the school's history. As in time past, the two schools would go their own ways until meeting in the NCAA Regional Finals. In 1999, Kentucky was the defending national champions and were coming off three-consecutive championship game appearances. The 98-99 squad had lost many of the key players who had helped them to the title the previous year, however winning experience in the tournament was a rare commodity and eighth-ranked UK could not be overlooked for that reason. The team was led by veterans Wayne Turner, Scott Padgett and Heshimu Evans. The head coach was Orland "Tubby" Smith, who was in his second year with the school after head coaching stints at Tulsa and Georgia. Second-ranked Michigan State was an up-and-coming program being guided by a former Heathcote assistant, Tom Izzo. Izzo had taken over the position when Heathcote retired in 1995 and was in the midst of putting together a powerhouse, in large part based on successfully recruiting the type of rich in-state talent which previously went to the University of Michigan and other Big Ten powers. The team was led by two All-American caliber players from the nearby basketball hotbed of Flint Michigan, point guard Mateen Cleaves and forward Morris Peterson. The program was also seeing renewed interest due to the opening of the Breslin Center in 1989, which replaced venerable Jenison Fieldhouse, a move which was long overdue. The game proved a classic, with Kentucky running out to a 17-4 lead, largely due to 12 points by Heshimu Evans, the UK spark plug. But MSU climbed back into the game and closed the UK lead to one at halftime as Cleaves hit a 3-point heave just before the buzzer sounded. The second half saw the two teams remain close until Michigan State took the lead with just over seven minutes remaining. MSU was able to pull ahead by six points at a time when Kentucky had trouble finding the range. Evans, who had played a major role in the first half, experienced serious foul trouble and was shut out of the scoring column in the second half. The Spartans received some clutch long-range assistance from reserve forward A.J. Granger (who hit 14 points on 3-3 three-point shooting) to go along with 19 points and 10 rebounds from Peterson, 14 points from Andre Hutson and 10 points and 11 assists from Cleaves. Peterson hit six free throws down the stretch to keep the Spartans in the lead and to withstand a flurry of late three-pointers from Wildcat Scott Padgett. The scoring leaders for UK were Evans and freshman forward Tayshaun Prince while Padgett added 11 points. The following year saw a renewal in the regular-season series which had been dormant for over 25 years. The game was held just before Christmas in Lexington. Michigan State had returned the core of their final four team and added some additional pieces to their squad including freshman sensation Jason Richardson and Duke transfer Mike Chappell among others. Despite some early season losses, they were ranked #5 in the nation and looking like clear favorites over an extremely young Kentucky squad, which was in a tailspin after losing four of their prior six contests. In addition, the Wildcats saw themselves fall out of the Associated Press Top 25 for the first time in over nine years. Despite the disparity, Kentucky did have a few things in its favor. For one, MSU was without All-American point guard Mateen Cleaves, who was sitting out with a hand injury and would return later in the season. In addition, the game was being played in Rupp Arena, a venue where Kentucky rarely lost. The first half was a series of runs as after a few minutes, Michigan State took command as they sprinted to a 15-6 lead after a technical foul was called on UK senior center Jamaal Magloire. Leading the charge was Morris Peterson and guard Charlie Bell. 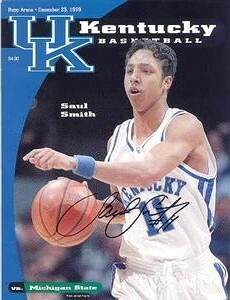 The Spartans extended the lead to 26-11 after UK's reserves got into the game and UK coach 'Tubby' Smith had gone to a small line-up. But the Wildcats adjusted and went on an 11-0 run to pull back into the game. Kentucky guard Saul Smith drew two charges late in half which gave Kentucky the opportunity to take the lead, however UK could only convert a free throw and the half ended with MSU on top 27-26. Michigan State had also been in foul trouble as their big men Andre Hutson and Aloysius Anagonye had difficulty containing UK's Magloire. Magloire ended the game with 18 points and 11 rebounds. A generally dismal free throw shooter throughout his career, Magloire sometimes exhibited moments of brilliance from the line and this game was a prime example, as he canned eight of ten tries. Also coming up big for the Wildcats was Tayshaun Prince, who scored 17 points, and reserve guard J.P. Blevins, who scored nine points on three of four shooting from behind the three-point arc. Morris Peterson led Michigan State with 18 points (13 in the first half) while forwards A.J. Granger and Mike Chappel each contributed 10 points for the Spartan cause. Said MSU coach Tom Izzo about the unranked Wildcats, "No other team we have played implemented and executed a better game plan against us." Michigan State would see Cleaves return to the line-up a few games later, and the Spartans would go on to win the NCAA title that year, the school's second. 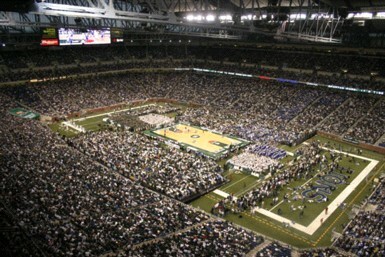 The return game the following year was held in Michigan State's Breslin Center and proved to be another close contest. This despite the fact that MSU was ranked #2 in the nation and the Wildcats were once again unranked, due to a slow start which saw the Wildcats drop four of their first seven contests. Kentucky surprised the crowd as they came out strong and held a nine point lead at halftime, limiting the Spartans to 18 first half points on 35 percent shooting. But Michigan State adjusted at halftime and opened the second stanza with a 13-0 run. "The second half we had to come out here and pick it up a little bit. We had to take the fight to them because they were taking the fight to us in the first half," said MSU senior guard Charlie Bell. The score remained close for the remainder of the game, with the lead changing hands four times in the final 10 minutes of play. With 26 seconds left in the game, Andre Hutson scored on a layup to put the Spartans ahead for good, 46-45. Kentucky had a chance when guard Keith Bogans penetrated the Spartan defense for a shot which failed to fall and failed to draw a whistle for a foul. The Spartans recovered the ball and were able to run out the clock for the victory. Said Kentucky coach Smith about the game, "There's no such thing as a moral victory. I was disappointed that we didn't finish, that we didn't get a stop there at the end." Added a dejected Bogans, "We wanted to come here and win. Whether we lost by one or 10 doesn't mean anything. We lost. It just hurts to lose by one point." The 2002-03 season saw Kentucky celebrate their 100th year of competition and they once again signed up to meet the Spartans in a home-and-home regular-season series. To commemorate the occasion, the Wildcats broke out a specially designed 'retro' uniform for the game against Michigan State before a national television audience. The uniform was gray with blue trim (presumably to approximate the gray observed in black and white pictures; I don't know that UK ever used gray jerseys in the past). To complete the look, the jerseys had a silky appearance (similar to some uniforms in the 1940's and 1950's) and a belt (also used in earlier uniforms). Unfortunately for Kentucky, the retro uniforms did not bring good luck. The Spartans raced out to a 12-4 lead to start the game. The Cats responded, however, on the backs of Keith Bogans and Marquis Estill and the Wildcats took a 27-19 lead before Estill had to sit down with foul trouble and just over eight minutes remaining in the half. The Spartans got back into the game and the score was tied 40-all at halftime. The game was a bruising affair between two very physical teams and the outcome was not revealed until the last minute. With just over a minute left in the game, Bogans scored to put the Wildcats ahead 67-66. Coming out of a time-out, the Cats switched to a zone defense which appeared to confuse the Spartans, who saw themselves run deep into the shot-clock cycle without a good look at the basket. With the shot clock winding down, Chris Hill threw the ball into the corner to little used guard Tim Bograkos who nailed a three-pointer to put MSU on top. The unlikely shot put MSU in the lead and the Spartans were able to hold on for the victory. Admitted Michigan State head coach Tom Izzo after the game, "I could lie to you and tell you I set that play up, but in all honesty, [Bograkos] was the sixth option of our five players." Leading the way for the Spartans was sophomore Chris Hill who scored 16 points, including shooting 4-6 from the three-point arc. Freshman Paul Davis added 13 points and Alan Anderson 10 for the Spartans. Bogans paced the Wildcats with 23 points while Estill and forward Erik Daniels each chipped in 12. The final game of the series was to be held in East Lansing, however Michigan State officials saw the game as an opportunity to try something different. Flush with their success over being part of a world-record hockey game crowd, they set their sites on breaking the world record for most spectators to watch a basketball contest. The site for the attempt was Ford Field, which was a new football stadium and home of the NFL's Detroit Lions, but was looking to host future NCAA Tournament events and thus were more than willing to accomodate such an endeavor. Kentucky was an obvious choice as an opponent, given their huge fan support throughout the country and their reputation for travelling long distances for games. There was huge anticipation for the game, with souvenir numbered programs and trinkets available to those who attended. 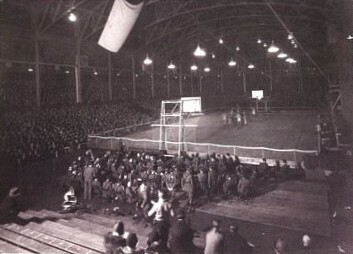 Unlike other basketball events held in football stadiums, the floor was placed near the center of the field (rather than putting it in a corner and cordoning off large sections) in order to maximize the seating possibilities. And from that standpoint, the game was a success as a new world record of 78,129 was indeed set to eclipse the previous record set decades earlier by the Harlem Globetrotters playing a game in Berlin's Olympic Stadium. Despite the unusual circumstances, the players of both teams played extremely well and put on an entertaining exhibition, although the large majority of the crowd left disappointed as the Spartans lost 79-74. Kentucky raced out to the 9-3 lead early in the game and later pushed out to a 15-point lead in the first half before the Spartans came back to close the margin to six point at halftime, 49-43. The game was physical with players from both sides making big shots. Michigan State made a number of runs in the second half to bring to within two points a number of times, but each time the experienced Wildcats pushed the lead back out to a more comfortable margin. Gerald Fitch led the way for the Wildcats with 25 points while Chuck Hayes, Erik Daniels and Cliff Hawkins all scored in double figures. Paul Davis led the Spartans with 24 points, which included a UK opponent record 14-14 shooting from the foul line. Shannon Brown and Chris Hill contributed 14 and 13 points respectively for MSU. Kentucky basketball was put on the world's largest stage and succeeded. Noted UK Coach Tubby Smith, "We are war tested. We've been hardened by the wars of the SEC and the type of schedule we play. We aren't intimidated by this kind of atmosphere." The following season Kentucky and Michigan State met in the NCAA Regional Finals in Austin Texas. Both teams were experienced and deep. The Spartans returned all their starters from the previous season, including Paul Davis, Alan Anderson, Chris Hill, Kelvin Torbert, Shannon Brown and Maurice Ager. They went 22-5 in the regular season and were ranked #15 by the Associated Press. Kentucky had one senior, Chuck Hayes but also had experience in Patrick Sparks and Kelenna Azubuike, to go along with a talented group of freshmen in Rajon Rondo, Randolph Morris, Ramel Bradley and Joe Crawford. The Wildcats had a 24-5 record, after dropping the SEC Championship game to Florida prior to the NCAA Tournament, and were ranked #7. The game lived up to its billing as the two programs slugged it out. At the end of regulation, Kentucky was down by three points and had one final possession to tie the game and send it into overtime. With 10 seconds remaining, Patrick Sparks let fly from the top of the three-point line but missed. Kelenna Azubuike grabbed the rebound under the basket, dribbled back out to the sideline and missed his own three-point attempt, but the ball ricocheted back towards Sparks near the top of the key. Sparks released a last-second shot that dipped into and high out of the rim before nestling back into the basket. The Frank Erwin Center erupted as the score was knotted at 75-all. The next five minutes were spent by the referees looking at Sparks feet on replay trying to find any shred of evidence that his foot was on the line, which would have given the win to Michigan State. Despite CBS providing heavily magnified and slow-motion replays, head official Jim Burr finally gave up and admitted that there was no evidence to overturn the three pointer. Said Sparks after the game, "We knew if it took that long, they didn't have enough evidence to change the call." The wait was especially agonizing to Kentucky fans as each time the replay was run, it showed evidence that MSU's Kelvin Torbert had fouled Sparks on the shot, but was not called. As the first overtime began, it looked like Kentucky would capitalize on their momentum as they rushed to a 79-75 lead while the Spartans struggled to get the ball past mid-court. This led to the key play in the game when the Spartans tracked down four offensive boards off missed shots in the same possession before Shannon Brown connected on his fifth three pointer of the night to put the Spartans on the board in the extra session. "That was a huge play," said MSU guard Chris Hill. "That was probably the turning point of overtime. We were struggling and had to have a basket. That gave us a big emotional lift." The play typified Kentucky's struggles rebounding the basketball against taller teams. 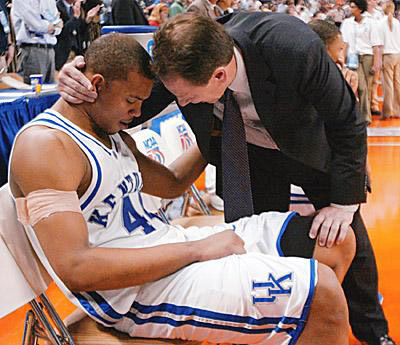 This was especially evident as Kentucky's leading rebounder that season, Chuck Hayes, was on the bench much of the late stages of the game with foul trouble. Kentucky had an opportunity to win the game at the end of the first overtime, however Azubuike was not able to get off a shot. Kentucky struggled to score in the second overtime, not connecting until two minutes were left in the period. The Wildcats twice cut the lead to two points late in the game however Michigan State prevailed as they hit all six of their free throws in the final 12 seconds of the game. The loss stunned UK's lone senior Hayes, who saw his dream of finally participating in the Final Four slip through his fingers. Said Hayes about the contest, "It was a great game and sometimes you get it and sometimes you don't. You figure if you give everything you have and all your hard work, you will get the result that you want." Michigan State coach Tom Izzo recognized the moment and went to console Hayes on the UK bench after the game was over. Said Izzo "He isn't the biggest or the best, but he is their version of what Mateen Cleaves was for me . 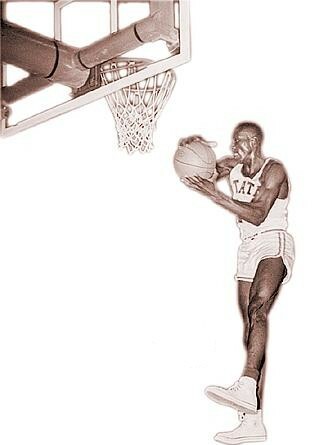 . . What Magic Johnson was to Jud (Heathcote). He is a winner." After nearly a decade of not facing each other, the two schools were matched up as part of the Champions Classic, a made-for-TV double-header sponsored by ESPN designed to kick off ESPN's coverage of the college basketball season. The event consists of a rotating matchup between of Kentucky, Duke, Michigan State and Kansas at sites around the country. In November 2012, a talented but inexperienced Kentucky team rated #1 in the preseason polls and a veteran Michigan State squad rated #2 met each other in Chicago's United Center. The Spartans took advantage of the Wildcats' (who started four freshmen) nervousness as first Branden Dawson, then Keith Appling, Dawson again and finally Gary Harris all stole the ball from the Wildcats within the first three minutes of the game. By the time Michigan State's Branden Dawson grabbed a rebound and threw a lob ahead to Denzel Valentine for a score, the Spartans were ahead 10-0. Noted MSU's Gary Harris after the game: "We wanted to punch them in the mouth first." The Spartans used their quick start to push out to a big lead, largely based on a 21-2 advantage in fast-break points. Despite 15 first-half points from UK freshman (and Michigan native) James Young, the Spartans were able to hold a twelve-point lead at halftime, 44-32. The Spartan lead grew to 15 points in the second half before the Wildcats were able to regroup and fight back, eventually evening the game at 66-all with five minutes to play in regulation. The comeback was led by freshman phenom Julius Randle, who was a force in the middle, scoring 27 points and grabbing 13 reounds while double- and triple-teamed and sophomore Alex Poythress, who gathered twelve rebounds (including seven offensive) and blocked three shots. Noted UK coach John Calipari about the double-teaming of Randle and the adjustment made at halftime: "We just said at this point, the only time they are stopping us is when you hold the ball, so quit holding the ball. Take it to the lane, ball-fake and if we miss, we will send everybody to the glass. . . Our offense was throw it up and go rebound. He is a fighter." The pressure on Randle took its toll on the Spartans as they began to put themselves in foul trouble trying to contain him. However Kentucky left points on the floor as they converted only 20-36 free throws. For Michigan State, the Spartans were led by guards Keith Appling with 22 and Gary Harris with 20 points. Big man Adreian Payne added 15. After Kentucky tied the score late in the game, Senior guard Appling hit a three pointer and this was quickly followed up by a steal and lay-up by Gary Harris which helped put the Spartans in the lead for good. Noted Appling after the game: "It's a great win, but we know we didn't really accomplish anything because it's a long season." Appling later noted "We want to be No. 1 at the end of the season, not the beginning." This game was the 40th meeting all-time between the No. 1 and No. 2 rated teams in the country per the AP poll, with the result a 20-20 tie. With two outstanding coaches, continued outstanding recruiting and an energized fanbase, it is expected that each program will continue to field competitive squads for years to come. History has shown that regardless of whether the two schools make it a point to schedule each other regularly or not, eventually the two will meet and when they do, the match will be a showcase for some of the outstanding teams and players each school can offer. Please note that the following reference materials were consulted for the above. 1.) Lexington Herald 2.) Louisville Courier Journal 3.) New York Times 4.) Detroit Free Press 5.) Big Blue Machine by Russell Rice 6.) Adolph Rupp: Kentucky's Basketball Baron by Russell Rice 7.) The Kentucky Basketball Encyclopedia by Tom Wallace 8.) The Winning Tradition by Bert Nelli 9.) Michigan State Official Website and online Archives 10.) Michigan State Media Guide 11.) magic moments - A Century of Spartan Basketball by Jack Ebling and John Farina among others. Return to Kentucky Rivalries, Michigan State Series Results, statistics, teams, opponents, players, coaches, opposing coaches, games or search this site.